By Lucía Rodríguez Sánchez, Director of Research, Finca Leola S.A.
Surá wood is heavy or very heavy, with specific weight between 0.65 and 0.7. The Terminalia oblonga’s timber has high quality and good physical and mechanical properties. Resistance to fungal attack is moderate; however, the wood is susceptible to termites on the ground, and its natural durability could vary with place of origin. The timber of this species is used in heavy general construction, interior and exterior construction, furniture [cabinetwork, floors (parquet), decorative veneers], bridge foundations, and ships. According to Flores1 (2002), drying is moderately difficult, and drying properties can also vary with wood origin. The wood may show splitting, checking, and slight warping. The fresh wood smells unpleasant but it is tasteless. The sapwood is creamy in its green state, and the heartwood is grayish-brown; when dry, the sapwood becomes yellowish-gray, whereas the heartwood intensifies its brown-grayish color and darker veins or bands appear in a brownish-olive-green color. The wood tends to oxidize rapidly when it has been exposed to air and light, (Flores, 19942). It has straight or slightly undulate grain; occasionally the grain is intercrossed; texture is uniform and medium. The luster is medium and the figure is striped. Terminalia oblonga is one of the emergent trees in the canopy of the rain forests and very wet forests. The geographic distribution of the species extends from Honduras to the Amazon in South America. In Costa Rican country, it is found on both slopes of the central mountains, from sea level to 900 m (2953 feet) elevation, with an annual rainfall between 1500 and 3500 mm (91.54 and 213.58 inches). The species commonly grows as a riparian (along the rivers and creeks). It grows well in many different soil types, but seems to be better in the well-drained alluvial soils of lowlands. Surá is a large tree, reaching up 45 m (147.6 feet) in height and 150 cm (4.92 feet) DBH. Usually it has a whitish, smooth, cylindrical, straight trunk. The bark exfoliates in whitish sheets. The cortex exfoliates in large and thin plates. The fallen plates are reddish-brown; the new bark is creamy-light-yellowish, and has a smooth texture. Terminalia oblonga has well-developed buttresses, and occasionally the species shows low branches. In Guanacaste province, on the Pacific coast of Costa Rica, this tree produces a very irregular and twisted trunk and generally grows as a riparian tree. It has been observed that blooming occurs between August and March, and the fruits ripen between January and April. The gathering of the fruits should be done directly from the tree, just after the process of natural dispersion by wind begins. The immature fruits are eaten by parrots and parakeet bands. Trials in the northern zone of Costa Rica indicate that this species does well in monospecific plantations; the studies indicate that this species is very selective about its growing sites and grows best in flat or semiundulating terrains. 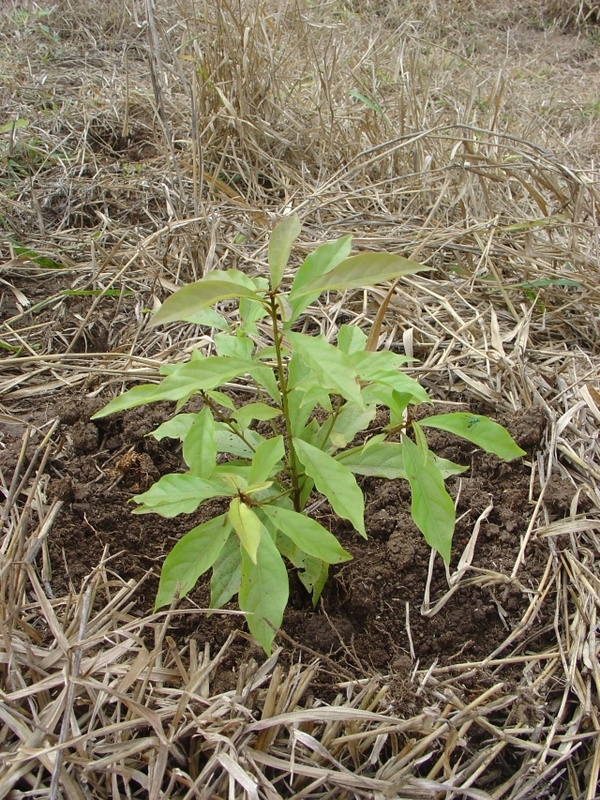 Surá has been planted at a planting distance of 2 by 2 m (6.6 by 6.6 feet) and 3 by 3 m (9.84 by 9.84 feet). This species has shown growths of 2 m (6.5 feet) in height and 5 cm (1.97 inches) in diameter during the first year. The species shows more susceptibility to foliage fungus and ant attack than Terminalia amazonia. 1Flores,E.M. 2002. /Terminalia oblonga /(Ruiz & Pav.) Steud. in Tropical Trees Seed Manual, USDA, Forest Service, Agriculture Handbook 721, October 2002. 755-757. 2Flores, E. 1994a. Arboles y Semillas del Neotropico. Vol. 3, Nº1. San Jose, Museo Nacional de Costa Rica. On the left is a picture of a surá that is only 20 years old. It is growing next to our plantation, in a location with similar soil and growing conditions. Yes, that is a man on a horse at the base of the tree. 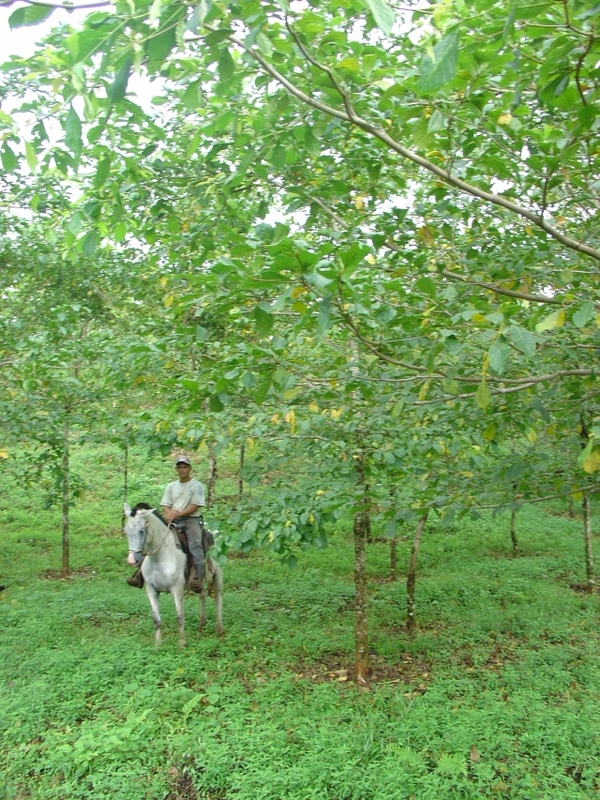 At right, a surá on our plantation that is three months old is shown next to a 1-meter flat. This tree was planted without first plowing the soil and is doing as well as those planted in plowed soil. 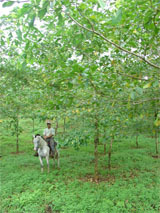 The other photo shows one-year-old surá in the foreground, on a slope above a field of teak. Finca Leola and FLSA are exclusive trademarks of Finca Leola S.A. All materials and content copyrighted 2003-2012. All rights are reserved worldwide.